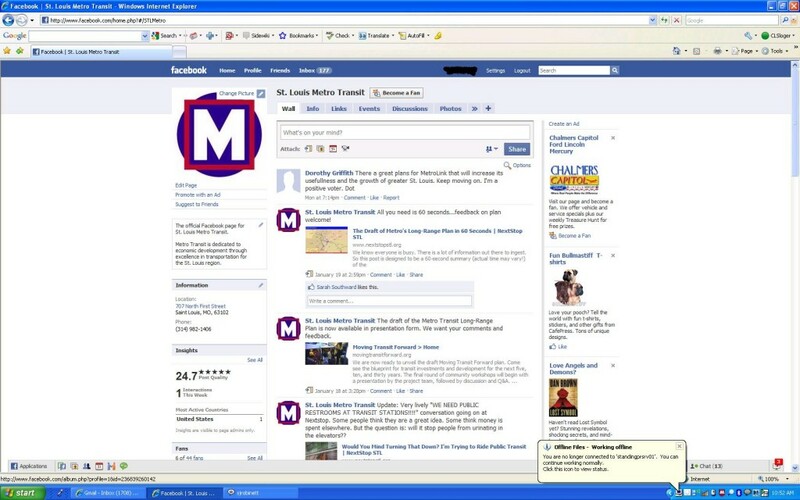 In addition to the blog and Metro’s official Twitter feed, STLMetro, we are now on Facebook at www.facebook.com/STLMetro. Become a fan, leave comments, suggestions for improving service, find out Metro and transit news, share information about Metro with your friends, and engage with other St. Louis transit supporters. If you have an idea for information you want to share with your friends (what Metro does, how we are funded, etc. ), let us know. I am neither a Facebook or Twitter user, so I don’t personally have much interest in either. However, for those that do – a quick look at places like Bay Area Rapid Transit in San Francisco and Metropolitan Transit Authority in New York shows that both transit agencies have icon links to Twitter and Facebook on their main transit pages. Perhaps Metro could add icon links to Metro’s main homepage? We’re launching a new website soon (first phase should be in a week or so, second phase by March), that will include social media icons on the homepage, just like SFBART or MTA. I’m pretty excited about the site, should make it easier to riders to find information, plan trips, etc., similar to Boston’s MBTA site. Glad to hear it. Any chance we are going to get a “new and improved” Trip Finder? Personally, I think the one we have now is horrid. From what I know, TripFinder and Google Transit are sharing trip-finding duties, and we hope to highlight Google Transit’s services more and more, especially for those that can access it on their phone.